Amphawa (อัมพวา) or Amphoe Amphawa is a floating market village located inÂ Samut Songkhram province about an hour drive from Bangkok. I spent time there both on the way to and back from Hua Hin. Although I was feelingÂ nauseous from food poisoning the whole time, I very much enjoyed my time there. I don’t really have much to say about Amphawa. It is certainly a great day trip away from the city and conveniently located on the way to Hua Hin. One thing though – be prepared to flight the crowd, especially on weekends. The food and shopping are great. It was surprised how clean it was considering the amount of tourists they get every week and the age of the village itself. However, there was this one ignorant dude that dumped gallons of what looked like beef broth into the canal. Amphawa Floating MarketÂ is an afternoon floating market by the canal near Wat Amphawan Chetiyaram. 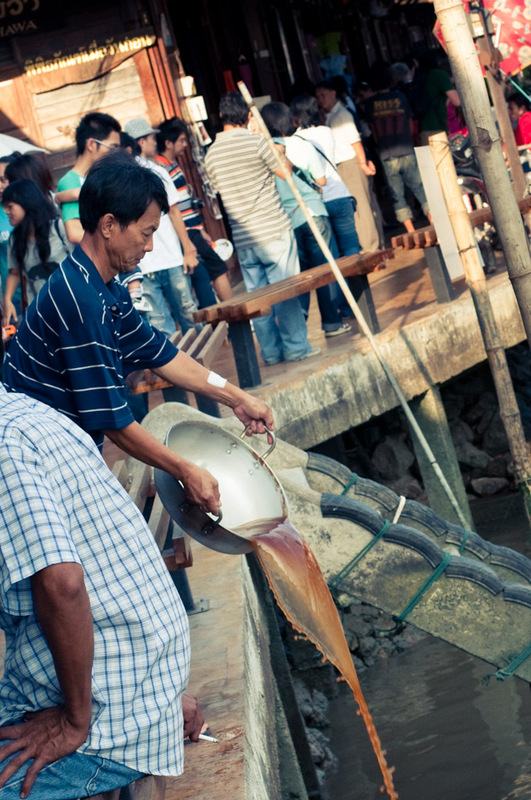 On Friday, Saturday and Sunday, during 12.00 p.m. â€“ 8.00 p.m., the Amphawa Canal is occupied by vendors who pack their boats with food and drinks, such as fried sea mussel, noodles, coffee, O-liang (iced black coffee), sweets, etc. Visitors can enjoy a cosy atmosphere and music broadcast by the community members, explore the market, have food, and hire a boat to see fireflies at night. © Mick Lerlop Photography 2012 I'm on Google+, Facebook and Twitter.